You and your Guests will Marvel at this Artist's interpretations. It shows more than a photograph. It's exciting. Inspiring. Demonstrates Creativity. Drawings created On the Spot. Gets the guests involved in having Fun so they can feel happy and comfortable at Your Party. Pictures, enjoyed throughout the Party, are then taken home by Your Guests as Personalized Party Favours. Alison has been entertaining at Parties and Events for over ten years. For Ages 6 - Adult Only. Allison was great, the teens loved her and her sense of humor. She's very professional, on time and does great work. Thank you, Allison, the kids had a blast!! Thank You, Lesley ~ Such Precious People ~ It feels so important to help them Enjoy and Celebrate This Special Time of their lives. You're doing that great, and I feel glad that I can help you do it. Alison came early and was well prepared! Her energy was just off the hook!!! The kids loved her as well as the adults. Alison is an artist. Her energy lights up a room like a rainbow. I’m grateful I found her and would hire her again. Alison made every animal in the Chinese Zodiac for our Lunar New Year! You sure made my day (and your Guests day) Special. AMAZING!!!! 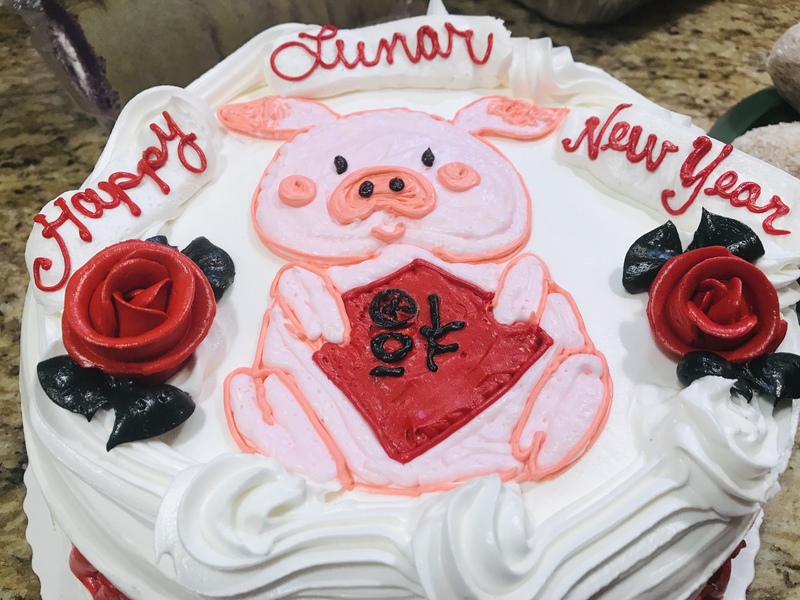 She did a great job and our residents LOVED it. 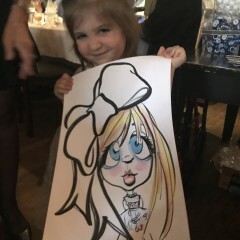 The caricatures were spot on and adorable. It felt so comfortable and welcoming at your Assisted Living Facility in East Northport. We had a great experience, she's great with children! Highly recommend! Great job & very kind! Alison was not only wonderful to work with, she did such an amazing job! We hired her for our daughter's 2nd birthday party. 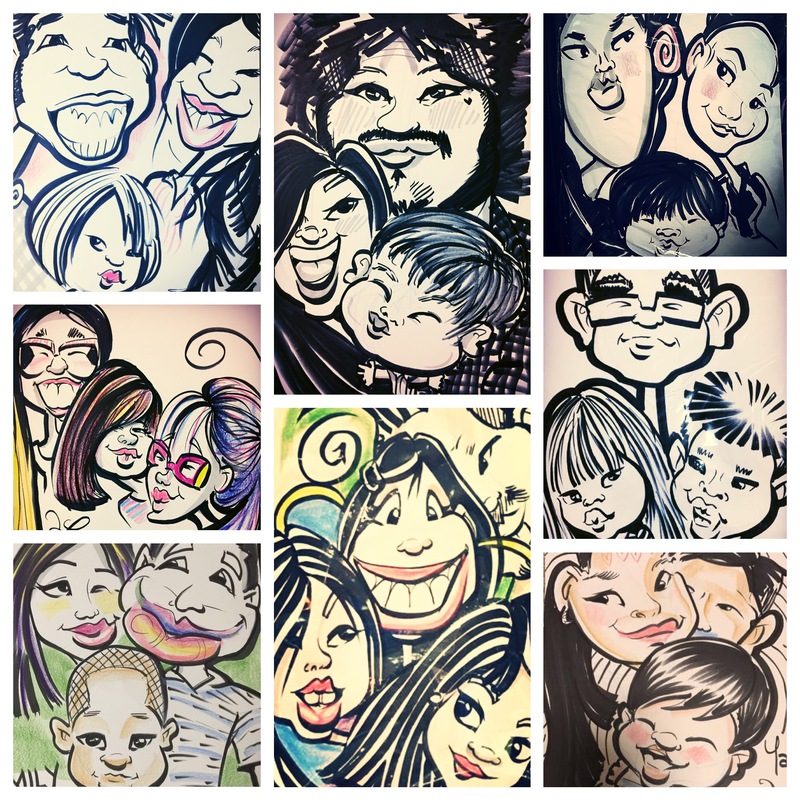 We thought having caricatures done of the kids would be a great souvenir, and it was! Every kids' picture had a different pose or facial expression, no two drawings were the same. Each drawing was done super quick also, great for 2-7 year olds who really do not want to sit still for long. It was a pleasure working with her and I would absolutely recommend her services! Thank You Sabrina ~ You really made my day! 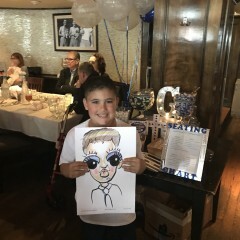 We loved our caricatures! The kids had so much fun! And we would totally use her again!!! Alison did a great job stayed later than expected to accommodate client requests. Alison was a great artist. She had a wonderful personality. She made the people laugh. It was a great pleasure working with her. Thank You Ja'Net. I felt so happy to be Drawing for JUST LET ME PLAN ~ It's quite an UpScale Company, and everything went so smoothly at the Party. 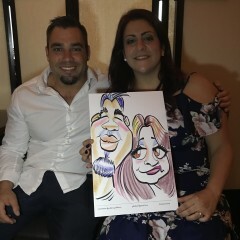 was very upbeat pleasant and worked great with my guess, very one was on line to get there image on caricatures, Lots of fun. 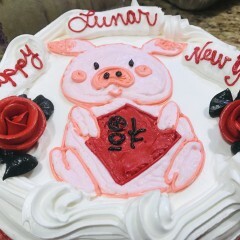 Thank You Dear Erica ~ It's my pleasure to be involved with your Celebrations! Party Express did an awesome job!!! 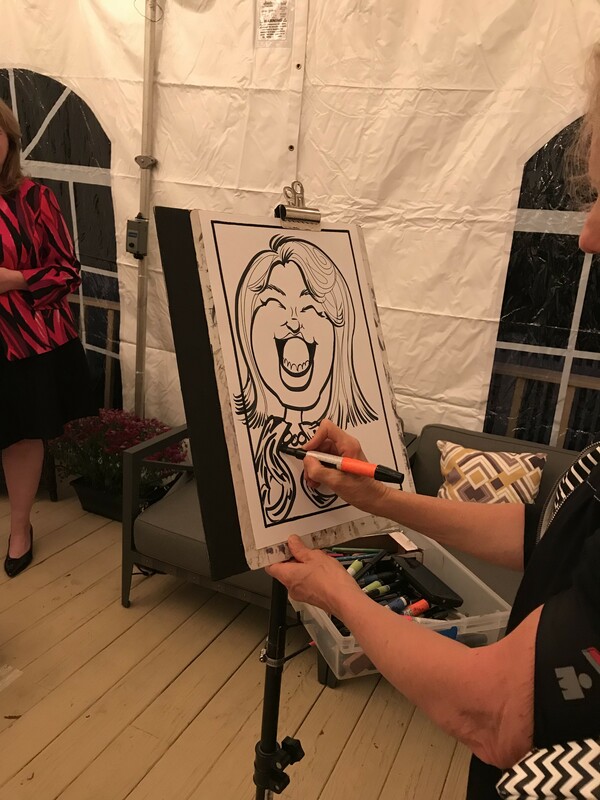 The caricaturist was a hit at the party! Everyone had a great time looking at the awesome artwork! Thank You Susan ~ I love to see how the people respond to my Caricatures. All Ages. Alison was amazing!! She made everyone feel comfortable, she even brought her own boom box and great tunes. 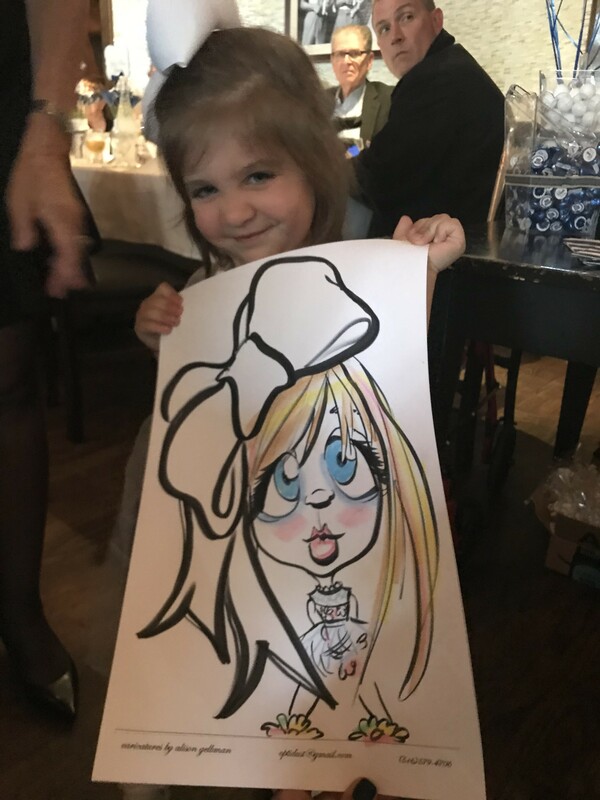 The kiddos danced around and everyone had a blast getting their caricatures drawn. I can honestly say, she was the highlight of our party! Her work is so pretty, each drawing is artwork and very flattering! Thankyou! I felt sp happy that everything worked out so well for Your Daughter's Party. Alison Gebner was the artist who found me and I have to say she did an incredible job. All of her art was wonderful and everybody truly enjoyed it. I would recommend her to anybody. Very warm and friendly person as well. Thanks again Alison!! Thank You Jerry ~ I feel so happy to be part of your Wonderful Experience. 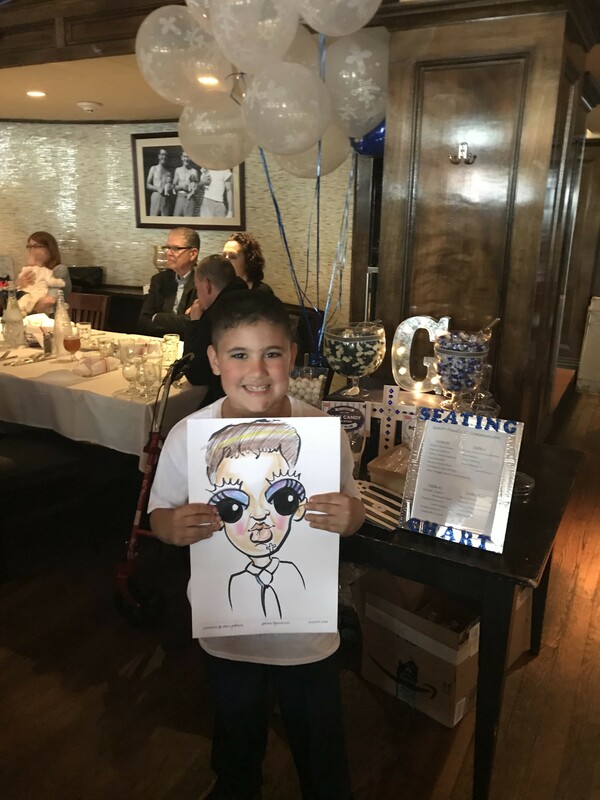 Everyone had a great time doing these caricatures. Was friendly and patient and kept it fun throughout. Thank you for a job well done. It was a nice addition to have at our party because everyone enjoyed it and it is memorable keepsake. Best I've ever seen andpaid for! Thank you Allison! Our guests absolutely loved your work! Thanks for sharing your talent with our family and friends!! Best face painter I have ever seen!!!! Kids adored her . Very professional! Loved everything!!!!!! 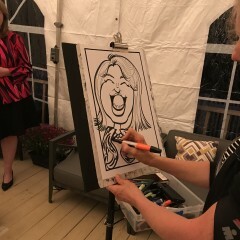 Alison did a great job with the Caricatures at our party. This was a perfect fit for the party and a really big hit. It was an adult birthday party, so I wasn't sure how it would go over and to my surprise it was a huge success. Everyone was very pleased. The children loved their balloons. She was patient and so polite! Thank You Nicoletta ~ Thank You to all my most Wonderful Gig Salad Clients ~ I feel so happy for the opportunities I get to help People Celebrate! In this case, the Guests were Wonderful ~ It feels so good to be with Children who are allowed to be Children. Really Enjoying the Wonderful things we bring them. Allison is a perfect entertainer. She was punctual, professional, friendly and TALENTED! 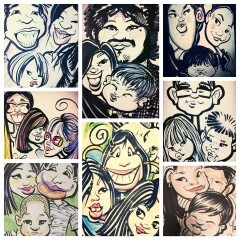 She provided our family caricatures for Christmas gifts and while the experience was FUN, the caricatures were amazing! I just ket her do her thing, since she was the artist and the work was superb! 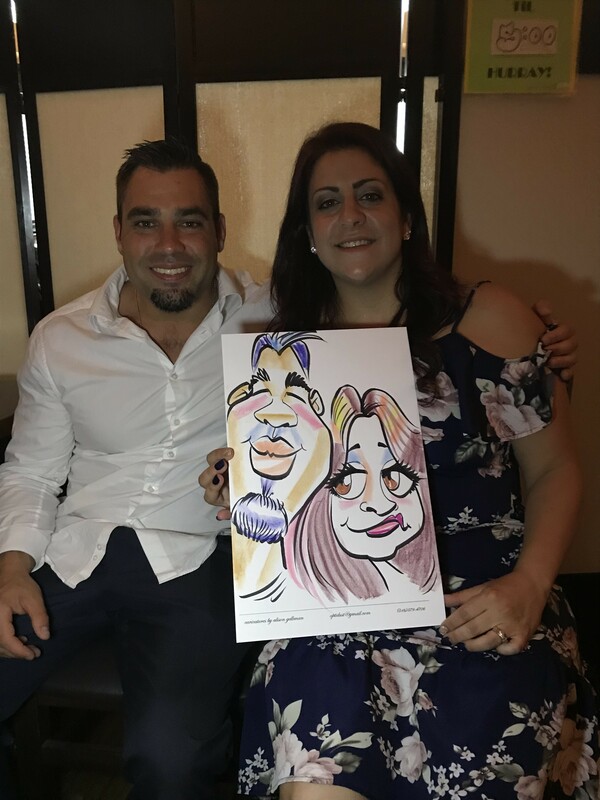 She managed to catch the true essence of each of my kids somehow in their portraits and the final caricatures were funny, realistic, colorful works of art! They are hanging on my wall and will adorn the walls of my family this year. Alison is easy-going and happy to be with people of all ages. She usually arrives 15 - 30 minutes before the scheduled Entertainment time ~ so she can set up for the maximum benefit to your Party. 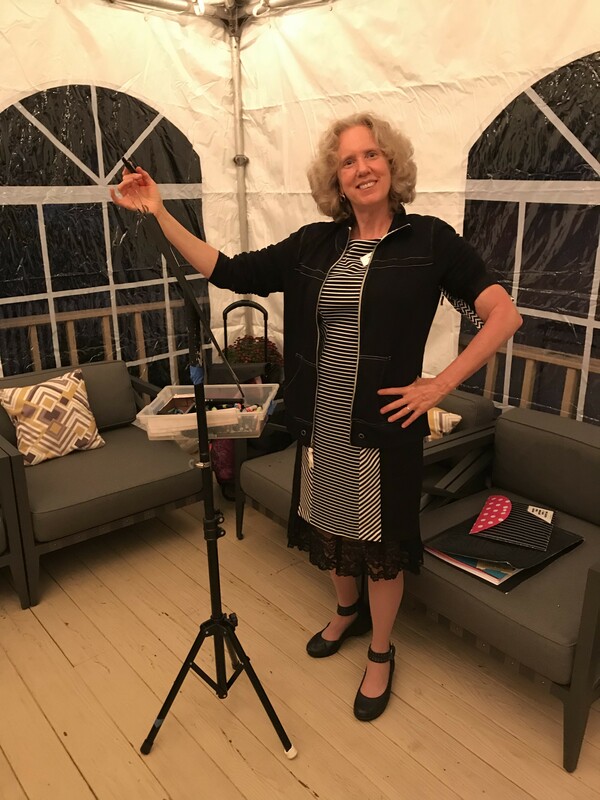 She's been working as a Party Artist for over 10 Years, so she has a pretty good handle on what will work best for your Party. It's usually best if you choose to set up the Art Entertainment in a prominent place in the Party Room. Because it's just as Entertaining to watch the Artwork be created as to Experience the finished Products. Guests are frequently quite Surprised and Delighted when they see the Unique Artwork that Alison can make at Your Event. Plastic bags are provided for Caricatures Or Fashion-Sketches ~ so they can get home safely as well as being seen throughout the Party. And of course Face- Painting Or Balloons Or Freehand-Glitter-Tattoos are seen throughout the Party too. It will sure look like a Party is going on if you have Professional Party Art. People enjoy seeing each other as the Artist sees them. Special Fun. And the Artwork is taken home by your Guests ~ Prompting them to recall Your Special Celebrations. The good times. The pictures on this page should tell you something, and you can see thousands of Alison's Samples on her websites. 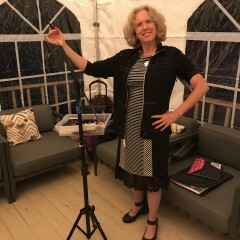 Meanwhile, please scroll through the Gallery Pictures here at Gig Salad ~ It's photos taken live at some of the events where Alison has worked. Contact her if you'd like to see more of her Caricatures, Face-Painting, Freehand-Glitter-Tattoos, Balloons, or Fashion-Sketches. It's easy to hire this Artist. You can get it done quickly by sending the deposit right here through Gig Salad. Or you can communicate directly with the Artist if you have any questions or concerns. Just show up with your special guests, and Alison can make it a Party!